Surprise! Earlier today, Apple released iOS 6.1.1 specifically targeted at the iPhone 4S. Over the weekend and as late as this afternoon, I was blogging about the first developer release of iOS 6.1.1 with regard to improving Apple's Maps app, addressing an Exchange Server bug bedeviling corporate customers, and poor battery performance. This evening, Apple rolled out a very narrowly targeted version of iOS 6.1.1 specifically to address that last problem - poor battery performance with the iPhone 4S. 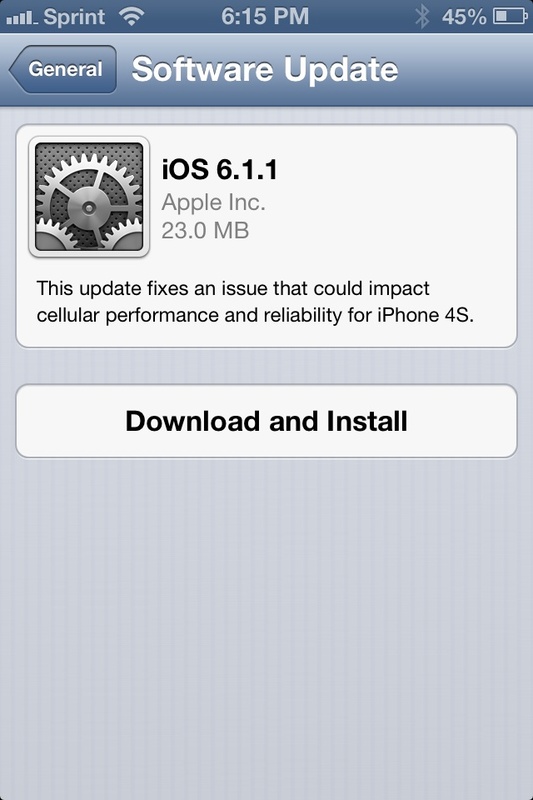 "This update fixes an issue that could impact cellular performance and reliability for the iPhone 4S." The 23MB over-the-air (OTA) update was available on my Sprint and Verizon iPhone 4S handsets. There is no word on whether or not Apple will release an iOS 6.1.1 for all other current model iDevices or if Apple will just move on to the next version number such as 6.1.2 or 6.2. We also don't know when we might expect a fix to the bug in Microsoft's Exchange Server messaging platform that causes devices running iOS 6.1 to get stuck in a loop when trying to accept an invitation to recurring meetings. There was no word on when an update to Apple's Maps application would be made available either. The iOS 6.1.1 OTA update took about 15-20 minutes start to finish on my iPhone 4S units. The update is also available as a wired update via iTunes for Mac OS X and Windows PCs. Google Play: App Ecosystem or Security Risk? Microsoft Surface Pro "Sells Out"